Despite all the challenges, regulations and roadblocks the cannabis industry faces, the vast majority of marijuana companies are actually doing well financially. Nearly 90% of operating dispensaries and recreational marijuana stores, infused products companies and wholesale cultivators – the three pillars of the MJ trade – report that they are profitable or at least breaking even, according to the 2016 Marijuana Business Factbook. Cultivators can hit profitability fairly quickly – often after the first harvest – and many find it relatively easy to stay in the black. This is particularly true in states such as Connecticut that issue a small number of grow licenses, which helps minimize the competitive playing field. That, in turn, can help prevent price drops. However, wholesale growers in some markets that have higher (or no) caps on licenses are increasingly facing competitive pressures and other challenges that could have an impact on the bottom line. Growers in these markets also have to face off against a vast number of competitors. Infused products companies also hit profitability fairly quickly. They lead all sectors of the industry, with 91% of infused products businesses reporting that they are at least break-even. Startup costs are often much lower for infused companies vs. cultivators and retailers, making it easier to turn a profit. 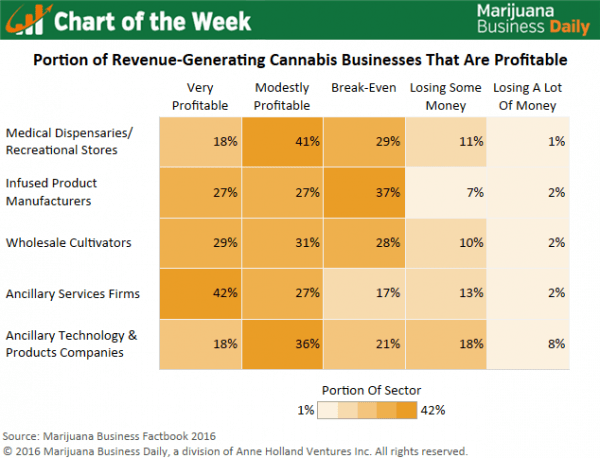 Profit margins in the retail side of the cannabis industry are more modest due in part to the fact that average startup costs for dispensaries and rec shops are higher than other sectors of the marijuana business. Median operational costs for retailers are also the highest in the industry, at around $600,000 annually. Notably, there’s a split when it comes to ancillary business. Companies that provide services to the marijuana industry and its customers are doing very well, with more than 40% reporting high profitability. However, many ancillary products and technology firms are still finding their footing, with 26% losing some or a lot of money – the most by far of any sector. Many of these companies must shell out a lot of money to get started and face very strong competition, making the runway to profitability much longer. Most of the businesses that aren’t yet making money are likely startups that are just getting underway, although some simply aren’t doing well. And, of course, the numbers don’t include businesses that were losing money and eventually folded. I find this very profitable & modestly profitable questionable. The fact their are limited deductions and recalls for cultivators & dispensaries. Cultivators have normal business deductions. If it were not profitable, people wouldn’t be doing it. I’d report lower profits no matter what. Who wants competition? Oh, perish forbid that we should have price drops, making it more accessible and affordable … Free enterprise yes, creeping supercapitalist greed, no. This is Sacred Herb we’re talking about, not corn or soybeans. Thanks for the timely chart! I’d like a clarification with examples, please. Please tell us (with examples) what types of businesses are in the ‘ancillary services firms’ category and which types of businesses are in the ‘ancillary technology & products companies’ categories. I find terms such as “very” and “moderate” to be nebulous and therefore meaningless. I would find more helpful if you provided percentages of profit that relate to the terms e.g. very profitable businesses are those that have net earnings of 20% or greater. Wow. 20% is loser land. I can do twice that just playing the stock market. And thats like 3 hours a day. Give me a break already. This needs to be worth my time, lets say 50-200%. Could you explain to me how 200% of an industry can be profitable? This chart isn’t about profit margins or ROI. It is showing what percentage of the industry is profitable. He cant read the title of the table. He thinks those are profit margins and not market shares.. I would love for you to show me your stock market skills. So the idea here is to “close the loop” and have all 3 thereby mitigating financial risk, merging expenses, and therefore increasing profitability. this can only be done in certain states at present, but if one can afford this it is the way to go. It’s a shame a lot of people that spent the better part of their careers demonizing and prosecuting cannabis are now oozing their way towards the profitable side of it. Reminds me of stories I heard of police and politicians funding the illegal speak easies and hooch houses during prohibition.